Horatio Alden Smith made the bulk of his fortune as the co-owner of the Smith and Wyman Sash and Door Company in Minneapolis. The door and sash business boomed in Minneapolis between 1880 and 1885, leaving the already successful Smith with abundant wealth. In 1887, Smith commissioned prominent architect William Channing Whitney to design a castle for his family--wife, Eva, and daughter, Alice. 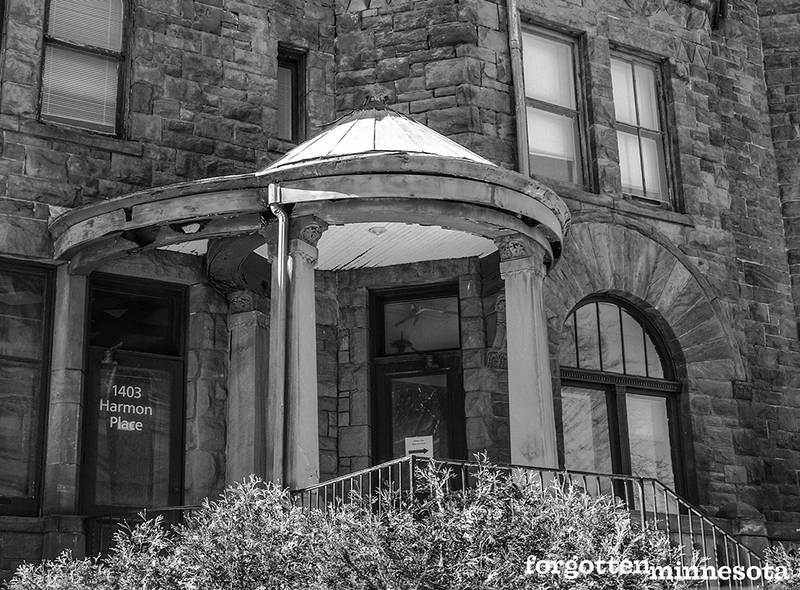 The Richardsonian Romanesque style mansion was built on Harmon Place and Fourteenth Street near Central (now Loring) Park--one of Minneapolis’ most fashionable locations at the time. 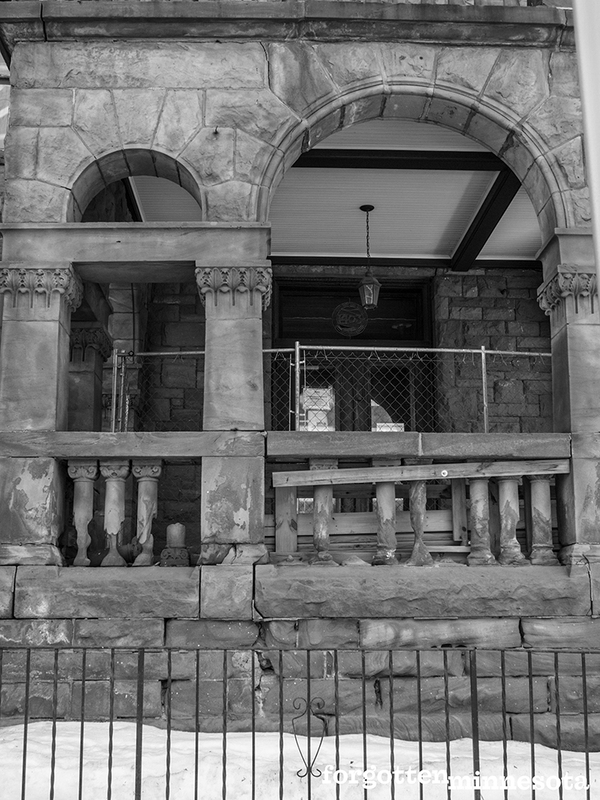 Today, it is the only remaining mansion in what was once the most elegant neighborhoods in the city. The three-story, brownstone home boasts a massive corner tower, front and side porches, stained-glass skylight and windows, and decoratively carved cherry woodwork throughout. The first level included a grand reception hall and staircase, parlor with two fireplaces, dining room, kitchen, sitting room, and a circular music room slash library housed in the tower. The grand staircase opened to an elegant hall on the second floor that led to several bedrooms and bathrooms. The third floor was dominated by a large ballroom that encompassed the tower. Servants quarters were located on this level as well. Many formal and informal social gatherings took place in the home. The Smiths were top-tier social elite often rubbing elbows with the Pillsburys, Crosbys, and Washburns, among others. John Bradstreet was an usher at the wedding of H. Alden and Eva in 1879. Their daughter, Alice, married the son of the New York politician and noted mathematician, Alonzo Barton Hepburn. Alden died at home in December 1906. 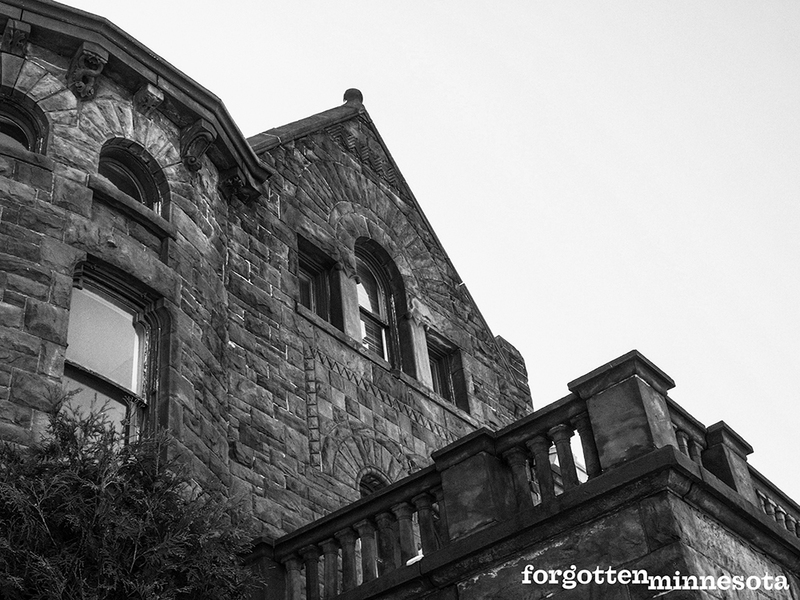 Eva continued to live in the mansion until 1919 when she sold it to William Davies of Davies Mortuary for $80,000. Some modifications were made to accommodate the business, including an addition that linked the house to the carriage house and the conversion of the kitchen into an embalming room. The remaining space on the first floor was used as reception and viewing rooms during funerals. Some of the original woodwork was painted and the second-floor rooms were converted into sales rooms for caskets and other funerary items. Davies Mortuary operated in this location until mid-1976. In 1977, The Little Prince Restaurant opened in the mansion, but it only lasted a little more than a year before closing. After a period of sitting vacant, the mansion went through a series of small businesses using the property for office space. In 1990, the interior of the mansion appeared briefly when the main character visited a physiatrists office in the movie, Drop Dead Fred. Today, the home is nearly surrounded by the Minneapolis Technical and Community College who owned the property between 1993 and 2018. They divested because the property was no longer of use to the college and needed several million dollars worth of renovations to meet their needs. The Minneapolis Planning Commission approved a plan in October 2018 that will turn the property into apartments and build a connected modern extension to the south of the original mansion with 80 additional housing units.